Mid-Year Marketing Performance Review – Identify the top performing revenue channels and make adjustments for a strong finish for the second half of 2018! 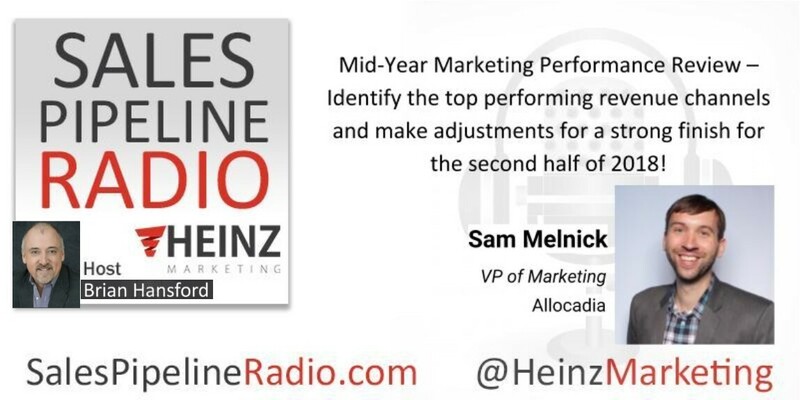 On this episode, Brian Hansford, VP of Client Services at Heinz Marketing hosts Sam Melnick, VP of Marketing at Allocadia. Look for the full transcription on our blog starting Monday, 5/28/18. In this episode we're talking about a mid-year review. As Sam says, "It all starts with the plan. So whether you're planning for next year or whether you're looking at what's going on in real time, measuring performance in real time or if you're doing that kinda half year look back, to me, it all starts with the plan. That's your roadmap. You set out your intentions. You set out where do we wanna spend time and money. What do we expect to get out of our time and money? And now you get that chance to compare results and hopefully adjust and improve. Brian asks Sam several great questions! Listen in to hear Sam's replies! When marketers are at both the strategic levels, CMO level and even operational level, are reviewing that data, what are some of the best practices that you see with your clients and even that you recommend in how they manage their budgets against the plan and make decisions on where to invest their resources? What should they look at in terms of reviewing their plan? How can they look at the data that they've been collecting and analyze that performance up to this point and use that to make plan adjustments and moving forward? Do you feel that marketers are getting better at measuring their performance against revenue? The revenue attainment and what they're actually doing to drive results. What are your thoughts on that and how should marketers consider using that when adjusting for a strong second half? Should marketers wait for a mid-year point to measure what's working? How often should they analyze what's working with a marketing performance management approach and solution and make those go, no go, or any sort of adjustment decisions, pulling investments, adding investments? I am an analytically driven marketing professional who has experience as a marketing leader, industry analyst, and customer success manager at a marketing technology company. My special talent is the ability to focus on details or specifics to execute, but also step back and distill this information at a higher, more strategic level. I am a student of marketing and will never stop learning about and discussing marketing. Some of my favorite topics are: Marketing technology, marketing benchmarks, change management within marketing, and building high performing teams. Feel free to reach out if you want to connect around interesting ideas, projects, companies, and/or tools! Outside of work I love skiing, basketball, and cooking. Additionally, I am a barbecue and craft beer aficionado.